Imagine with me for a moment: a crisp night, crackling fire, blankets, loved ones all around enjoying hot beverages and warm, fresh out of the oven, banana bread. Are you drooling yet? I was too until I looked at the thermometer and remembered it was over 100°F outside! I know it’s Summer right now and many places are sweltering and hot fires are the last thing you would want in your den, but…isn’t that one reason why we preserve all summer long? The garden’s bounty is amazing right now and we know that come Fall and Winter we will thank ourselves for the time we’ve spent harvesting and canning while the produce is fresh. It was quickly clear to me that we needed some of these monkey treats on hand! I’m a quick study – especially when impatient children are involved – and I learned to buy more bananas than what my family would eat in a week’s time. As we consumed one bunch, the second bunch would turn a lovely brown and I could freeze them to start to build my stash. I was pleased with my new plan until the first time I went to the freezer to get bananas for our muffins. I was torn between peeling the bananas immediately and freezing my fingers or letting them thaw first and then making a huge peeling mess with mushy bananas. My decision? 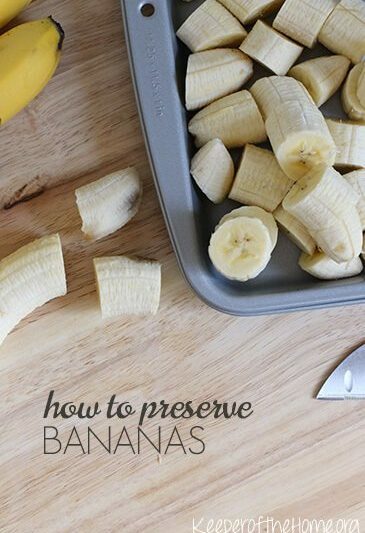 Peel the bananas first, then freeze them! The bananas shown above have been peeled and laid separately on the cookie sheet. They are ready to go into the freezer. (I assure you the cookie sheet is clean. Interesting things happen to your bakeware when you’re teaching four little ones to cook!) 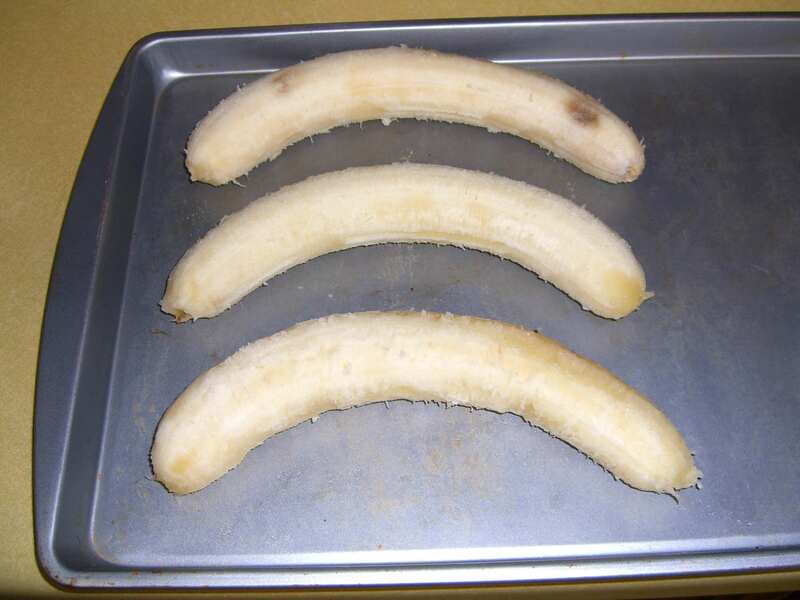 Sometimes I will lay a piece of wax paper over the cookie sheet before laying the bananas on it. This makes for a really easy transfer into the final storage container, but often times I feel a bit wasteful just throwing the paper away so I will skip that step. Freezing times will vary depending on how much fruit you’re freezing at once, but I usually set a timer in 20 minute increments so I won’t forget about my bananas and ruin them. Once they are frozen, you can move them into your favorite freezer storage containers and label them appropriately. 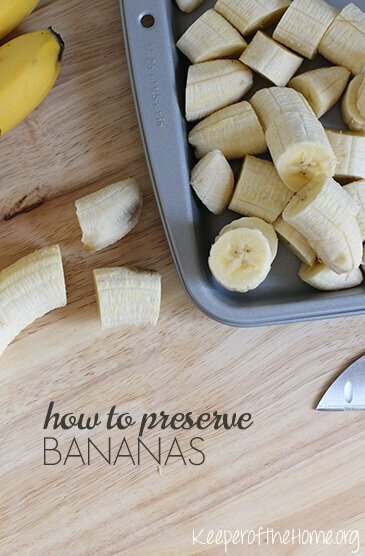 Do you freeze your ripe bananas? What method do you use (and what yummy things do you make with them)? Get Outdoors and Get in That Sunshine! Oh my gosh I never knew that about the roses! Wow! I’m going to do this today! @Sarah @ Mum In Bloom, Sarah, I’m so excited to hear that you’re going to use your banana peels on your rose bushes! 🙂 It’s so wonderful to buy things in bulk knowing that you will be able to use every last item without it going to waste. I’d love your recipe for your Banana Oat Mini Muffins, too! I just put mine in a freezer bag and then we use them for fruit smoothies almost every day. I’m going to make this muffin recipe ASAP! Thanks for sharing. Just last week there was a blog that showed how to make banana ice cream! Simply take 3 bananas and break them in pieces. Put in the freezer for at least 1 hour, maybe a bit more. Put them in your food processor, and process till creamy and soft serve/custardy looking. Add some milk, kefir, yogurt, etc, if necessary, to thin out just a bit. SO easy and SO delicious! @Cindy (FarmgirlCyn), Yum! A banana/kefir smoothie – sounds like an delicious recipe! I freeze my bananas by peeling and sticking onto a cookie sheet, then putting into a freezer bag once frozen. I use how many pieces I want for smoothies. Years ago, when my boys were little, I would slice bananas into three large chunks, dip them in carob syrup that I made, and then roll them in unsweetened coconut and freeze them. Frozen bananas are just like ice cream in texture. Yummy!!! @Susie wankerl, Susie – those frozen banana coconut snacks you made for your boys sound like something my crew might like, too – especially in this heat – whew! I just throw the whole banana in to the freezer. When I’m ready to use it, I either defrost in the microwave or set out on the counter for about 20 minutes. I use a knife and make a slice down the side, squeeze, and out pops the whole banana. I just throw them in the freezer peel and all and then when I want to use one, pop it in the microwave for 30 seconds. Comes out perfectly “mushed.” This works if you still use a microwave in your house. @Pam Howard, lol – yes, I guess having a microwave would be beneficial for that defrosting tip. 🙂 Thanks for sharing your tip! I regularly freeze bananas, also. I have never heard of using the peels for rose bushes! I’m going to try this as soon as I get some banana peels. lol Thanks for the tip! Boy, and I have been torturing myself with bananas frozen in the peels all this time! It makes my fingers hurt just to think about it :D. Great idea! From now on I will “cookie pan freeze” my bananas! Also, I had no idea that roses loved banana peels. They (the bananas) have been joining the other fruits and veggies in the compost bin. I’ll share the bounty with the roses too :D.Thanks! I just peel my bananas and stick them in a sandwich bag or wrap in plastic wrap (and freeze them individually or in groups of three) to freeze. I wish I had enough freezer space to get a whole cookie sheet in there, but unfortunately I don’t! I usually do groups of three because I use that many when making banana cake or banana bread/muffins. Sherrie I am excited to try your muffin recipe! We make banana muffins every week for breakfasts using a recipe from a Moosewood cookbook. We alter the recipe a bit and bake them in our toaster oven (we avoid our oven like the plague in the hot Phx summer), so sometimes they bake a little differently. 3. Mash them and freeze them in mason jars in appropriate quantities for the recipe. Thaw in sink of warm/hot water until able to plop out of jar. Thank you, thank you for this simple idea! I often freeze my ripe bananas whole, because I make banana muffins weekly. But I hated how difficult they are to peel after defrosting them… now I have an easy solution! I never knew that about the peels! I love that everything God makes has a purpose! I keep bananas in the freezer for smoothies and it has never EVER occurred to me to peel first, then freeze! Oy. Thanks for this! @[email protected], You will be so glad you did. 🙂 And you’ll want to make many, many more smoothies! I peel and immediately wrap in Press-n-seal. I wrap the bananas individually, not enmass, then pop in the freezer. No transfering, and I can choose how many bananas I need, and just defrost that many. Works wonders, and saves the bags and freezer containers for stuff that needs to be bagged or put in bowls, like berries, or that left-over clam chowder. I found this great recipe for banana bread – http://taketimetosmelltherose.blogspot.com/2010/06/tropical-traditions-coconut-oil-review.html It uses coconut oil (there’s a bit of an ad for that particular brand) and whole wheat flour and honey – no refined sugar! It turned out great and my 2 year old loves them! So much healthier than recipes with white sugar and flour… And, I also just microwave the whole bananas for a bit – on a plate, and they come out pre-mushed. Perfect and easy! And, now that i have an easy recipe that is actually healthy, I don’t feel bad eating them all of the time! Usually I buy a few bags discounted at a time, and I peel and put into bags in either 3, 6 or 12 size packs. I don’t bother flash freezing. I label the bag with how many are inside. I usually use them in 3, 6, or 12 for baking, and for smoothies, I just break off or cut off a chunk of the clump and it works well. As Nola mentioned, try to buy bananas on sale to freeze. Often our grocery store has bananas marked half price or less once they start to brown and can’t sell them. I always snap these up as freezer bananas (unless my freezer is already full!). Bonus, most of the time, these are organic bananas at my store. I freeze them with the peelings on. When I make banana bread, I put them all in a bowl to thaw while I get everything ready. By the time I’m ready for the bananas, they are soft, but not too mushy. I usually just make a slit in the top or side and they slip out of the peel. You may sometimes need to drain off some of the water. Sounds like a great recipe – I’ll have to try it soon! Thanks for the tip about the peels and roses – don’t have any roses yet, but when I do, I’ll have to remember that. Yes, I freeze banana’s. I use them to make, no dairy ice cream. I use our Champion juicer with the blank in the part where the fiber would normally come out and then we get ALL the banana in the “ice cream! Delicious! We also add other frozen fruit for variety sometimes, such as raspberiies or strawberries, nothing else and it is very good! The kids and I love it! Wish I had some roses to use up the peels. Could I use the peels with any other plants? I have herbs, chard, flowers, and soon to be lettuces. I buy bananas, the overly ripe ones that are on sale, and just peel them and pop them into freezer bags. I use them for milk/banana smoothies, but my favorite thing is to just get one, and eat it frozen! Yea, I freeze them peel and all. I’m lazy. I few hours in the bowl on the counter and they are ready for muffins or whatever mash treat you want. I didn’t know about roses, but recently found out that brown leaves on green beans means need potassium and burying rotting bananas or empty peels around the bases puts that in the soil. I love to use my over-ripe bananas! A friend of mine told me that frozen bananas make smoothies frothier so that’s what I use. When they get brown-ish, I simply peel them, break them in half (the amount I use in a smoothie for 1), and put them in a large baggie in the freezer (still trying to get away from he plastic – little by little). I do freeze them just by throwing them in a bag and tossing the the freezer. But I also keep a container of bananas in the fridge, letting them turn brown and syrupy. Then I use the banana glop in smoothies as a sweetener. We have raspberry bushes and have raspberry smoothies all year long. They are a bit sour in a smoothie for our tastes, and need a sweetener. Bananas that are brown are perfect! Freeze way over ripe bananas. When you are ready to use them remove them from the freezer enough time in advance to thaw in the fridge(I use a glass bowl). When needed for bread, pancakes, smoothies etc… holod squishy banana over container of choice and snip off the end of the banana with a pair of shears. Then squeeze the rest out. I keep a container n the freezer and throw my peeled over ripe bananas in as I accumulate them. When the container is full I know I have enough for a double batch of muffins. I then put it in the fridge and they are ready to use within a few hours – usually needing to be drained a little bit. After I learned about peeling them, I no longer worry about having purchased more then we will eat at a time. I absolutely must write a big Thank You for sharing your simple, common sense instructions for freezing bananas. A local grocery store had bananas on sale, @ .29 cents a lb…. we love bananas and need the potassium. On September 30th we picked up a case and was looking forward to the trying the various suggestions shared here. October 2nd… I woke up with my eyes feeling a bit “odd”; allergies maybe? Eyes not focusing correctly? Which Doctor should I call? Long story short; spoke with my family doctor’s nurse… described the “eye problems”… to which she said, “you get to the ER now”! I was having a TIA, (mini strokes)…. spent the night in the hospital and a gazillion of tests later showed no damage done! What a blessed relief! Came home to “all those bananas”! Lol Thanks to having read your post and comments from others, it was a simple task to peel, toss on cookie sheets, freeze and bag! Tried one this morning with half a peanut butter sandwich… delicious!! Thank you guys sooo much for sharing! BTW I just “found your site” a couple of weeks ago… thank you sooo much! Wow, thanks for sharing your story. I’m so glad that you are doing ok after that! I’ve been using frozen bananas mixed with all sorts of frozen fruits in a machine called Yonanas – which creates creamy frozen dessert with just fruit. 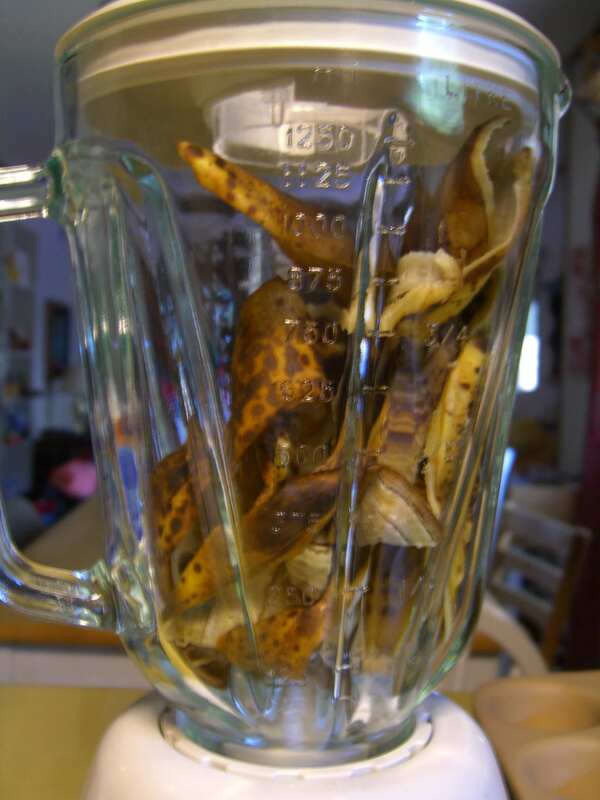 Thanks for the tip on what to do with banana peels! Hello Sherrie, just read your advice for the roses… I’ve always used the banana peel trown directly where the roses grow. And it works perfectly.